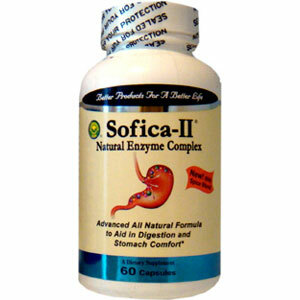 Sofica 2, a naturally balanced formula, aids in digestive health by stimulating and strengthening the stomach and intestinal linings. Exclusively designed to improve your body’s ability to absorb carbohydrates, protein, fat and fiber, Sofica 2 offers quick and easy results. Sofica 2 contains herbs, digestive enzymes, natural fibers and a type of intestinal bacteria called Micro Flora that is beneficial to your body. Fiber, papaya, coriander, bromelain digestive enzyme:pepsin, lactase, protease, lipase, amylase, cellulose, papain. Stimulating and strengthening the stomach and intestinal linings, improves body’s ability to absorb carbohydrates, protein, fat and fiber. For the first 5 days, take 3-4 capsules 3 times daily before each meal with warm water. for the next 10 days, take 2-3 capsules 2 times daily. After that, take 1 capsule 2 times daily. For children under age of 18 reduce the dosage as needed.